When I think about either Idly or Dosa, the first thing that comes to mind is naturally the spice powder that’s served or the Molaga podi which is an eternally side dish for these tiffins in Tamil Nadu or for that matter, any home in Tamil Nadu. We always have different spice powders stocked at home for different tiffins. And this is one of the variations we make. Since I decided to make condiments and microwave recipes for this week, I thought those spice powders will make a great choice and quick to make in microwave. I also made a chutney in microwave, making sure to kill two birds in one shot and the podi will be a great asset for masala dosas. But I finally made just the podi and chutney and saved the masala dosa for another day. There are many ways you can make a spice powder and use it in different ways. 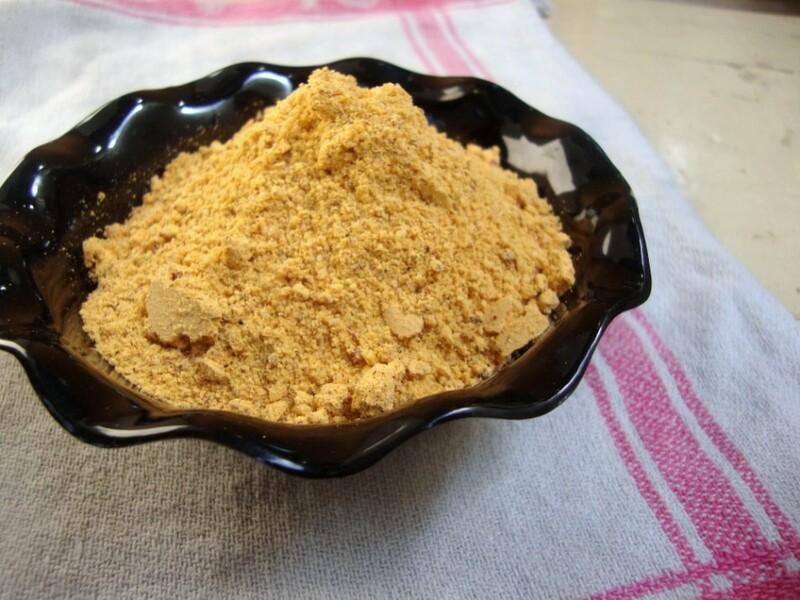 There are spice powders for enhancing the flavour, like Kootu podi, for enhancing the taste, like idli podi, for making a dish on it’s own like sambar. One can make lentil as the main ingredient, or a herb as the main ingredient in which case the herb is used in its dried form. 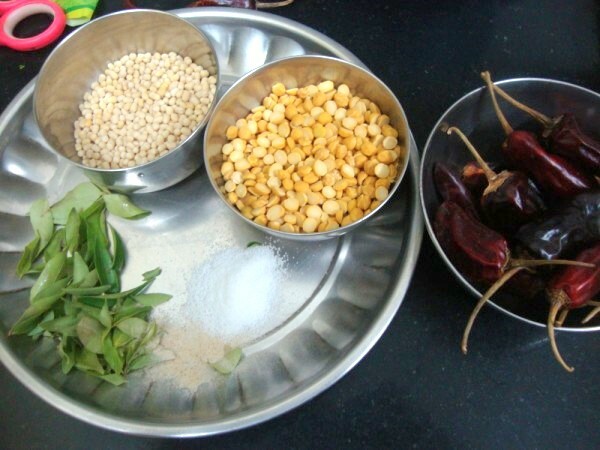 I am not sure about other cuisines, but from what I seen and done in Tamilian or Andhra Cuisine, spice powders play a vital role in many dishes. You make a vegetable sauté, finally sprinkle some spice powder and lo you have the most delicious curry on hand! The list is endless. For today’s post I made the famous Molaga or Milagai Podi for are eternally served with Idli, Dosa in Tamil Nadu. And that too in microwave where it took just about 4 mins to get the entire thing done. Cooking Time : 3 mins. Total time : 5 mins. Mixer with good strong blades. Once done, remove to the plate, add in the red chilies, salt, hing, and curry leaves. Microwave for 30 secs. Remove to a plate. Allow it to cool or put it under fan. First take the lentils, blend or pulse it for couple of times. Then finally add the chilies and blend again. How coarse you want depends on your preference. I normally make it little coarse so that you get to bite on the lentil. I made this for both my events Condiment Mela & MEC : Potluck Party, after all there is no party without this spice powder to spice it up! And of course to Preeti who is hosting MLLA # 38, an event started by Susan. wow, that is amazing, I am surely going to try this method. 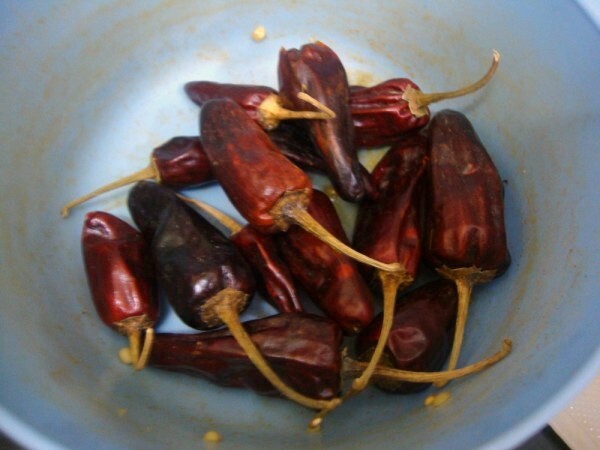 I have a question though, usually don't we dry roast dry red chilies as well? or am I a wrong? 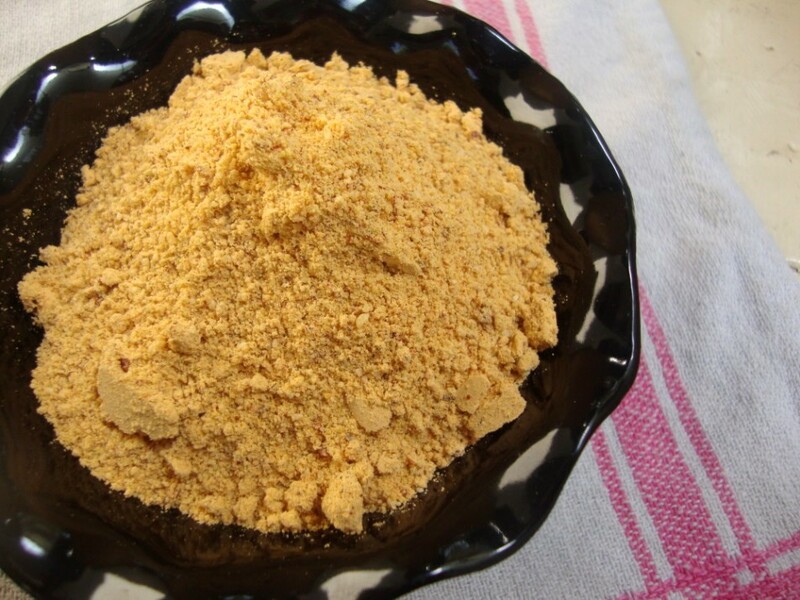 This podi is on my list .. just waiting for the current batch to get over. 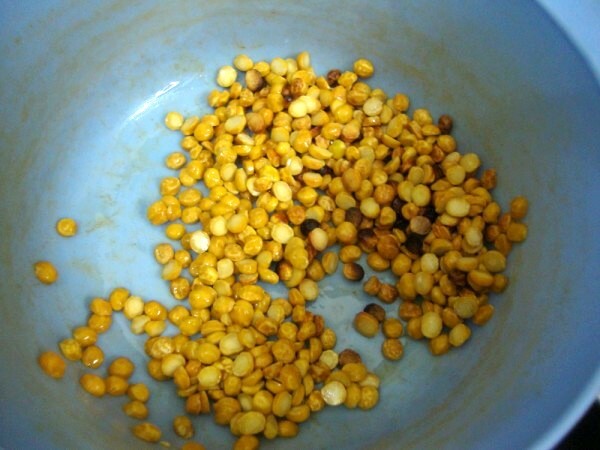 looks like a perfect time saver – my lifeline to Idlis and Dosas in a microwave- must try..
Spicy and yummy podi Valli. My mom always keeps me stocked with this all the time – I should probably start making my own now. Thanks for the recipe. Srivalli…u r an expert at using a MW….with so many different Indian recipes..u r truly an genius! Podi looks great! very delicious powder.. One of my dh favorites..
wow this is amazing..super quick. Valli…my journey to MW Cooking has started with u r posts…n these podis r actually new to me…infact i want to make some next ime i m cooking S Indian cuisine. Roasting the ingredients in the MW saves up lots of time. And we have to watch like hawk else will end up with charcoal like mass. Looks wonderful, even am making most of my spice powders in microwave oven if am preparing small quantity of them.. I like podis but rarely make them at home, as I rarely make idly & dosa. You are putting your microwave to good use. I use my mw for re-heating food and thawing frozen food. Hey Valli, thanks for introducing microwave for so many regulr dishes. Have to try your version. Does the quantity of chillies you mentioned makes this very spicy one? Suma, The podi turned out to be spicy, esp rice. But it so delicious with idly! 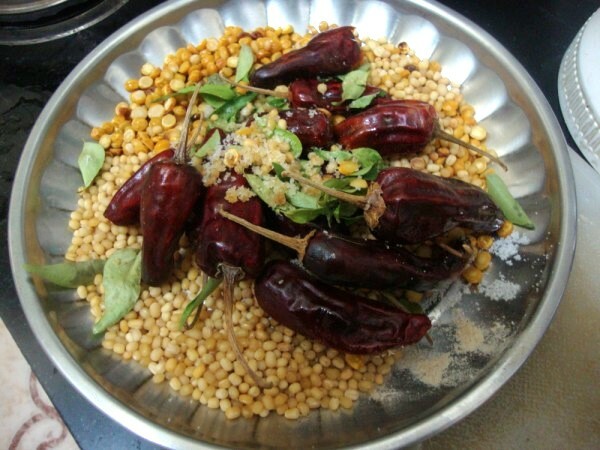 Mom used to make diff chutney and sambhar for Idli and Dosai but I always reached for Milagai Podi. There is something appealing and addictive about a milagai podi! What an easy way to make it in a microwave!